UPDATED 3/21/18 6:57 PM EST: Nathalie Fourdraine Variant Confirmed (Image Below). Chaotix and Rouge will also appear. With just two weeks before the official launch of the series, the solicitations for Issue #6 are now available! Issue #6 will continue the “Fate of Dr. Eggman” arc! * Guest starring: Shadow the Hedgehog, Rouge the Bat, and the Chaotix Detective Agency! *The second part of the gripping story, setting up the series through 2019! * Variant cover by Nathalie Fourdraine! It seems Sonic will be successful in tracking down Dr. Eggman with the help of the Chaotix, but it looks like someone else has a bone to pick with the Doctor as well! Issue #6 will be the IDW debut of fan favorite Shadow the Hedgehog! Moreover, it seems Rouge will appear along side Shadow as well. What will happen when these three big personalities meet? Pick up your own copy June 20th! Once again, Ian Flynn will continue as lead writer with Tracy Yardley illustrating the interior art as well as the B cover. The A cover will feature the work of Jonathan Gray. Now seemingly a staple, Nathalie Fourdraine will once again be illustrating the 10 copy incentive variant. Additionally, IDW has also listed a special Sonic the Hedgehog #1-4 Box Set that as the name implies, will contain the first four issues as well as another “very special sketch variant of Sonic the Hedgehog #1”. Yes, you read that correctly, yet another variant of issue #1 bringing the total to 9! IDW is definitely going all out with this launch! The set will be available June 13th for an SRP of $24.99. Collecting the first 4 issues of the hit new series! If you missed “Fallout” before, here’s your chance to hop aboard Sonic in this exclusive collector’s edition featuring the full, unaltered original art connecting covers by Tyson Hesse, plus a very special sketch variant of Sonic the Hedgehog #1-perfect for conventions or in-store signings! Are you excited for the first appearance of Shadow? I for one am curious how this encounter will pan out and what each characters motivations are? How is Eggman recovering from his most recent defeat? 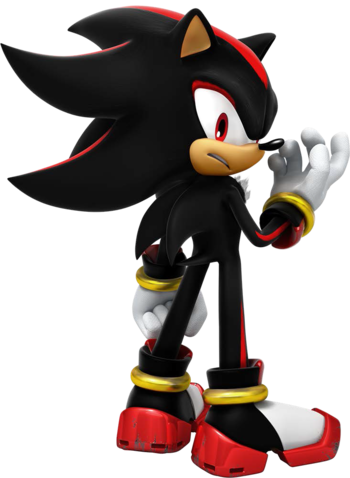 What grievance does Shadow have to air with Eggman? How will Sonic resolve this situation in his heroic manner? Let us know what you think will happen in the comments below! Next WonderCon Has Begun! Issue #1 Arrives! That’s embarrassing, I forgot to check diamond previews for hidden links per usual! Ah no problem, I just stumbled upon it in a forum. Indeed, usually the Diamond Previews will list the A & B covers but not the variants. But the pages are still there, you just have to figure out the URL! Thanks for the heads up! “Guest starring: Shadow the Hedgehog, Rouge the Bat, and the Chaotix Detective Agency!